Report on Tabletop Photography Workshop, etc. ≈ Comments Off on Report on Tabletop Photography Workshop, etc. 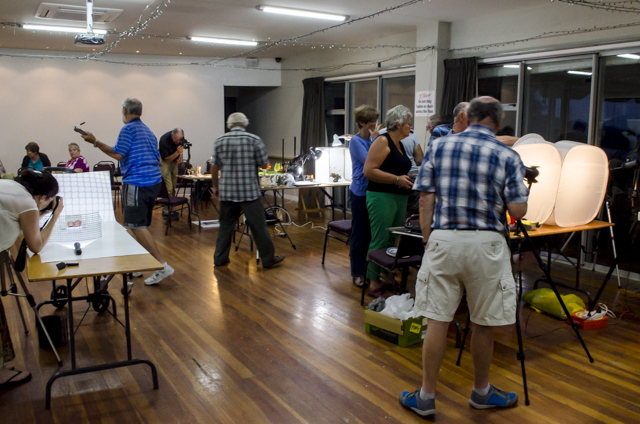 Monday 9 March 2015 saw the whole meeting given over to a Tabletop Workshop. 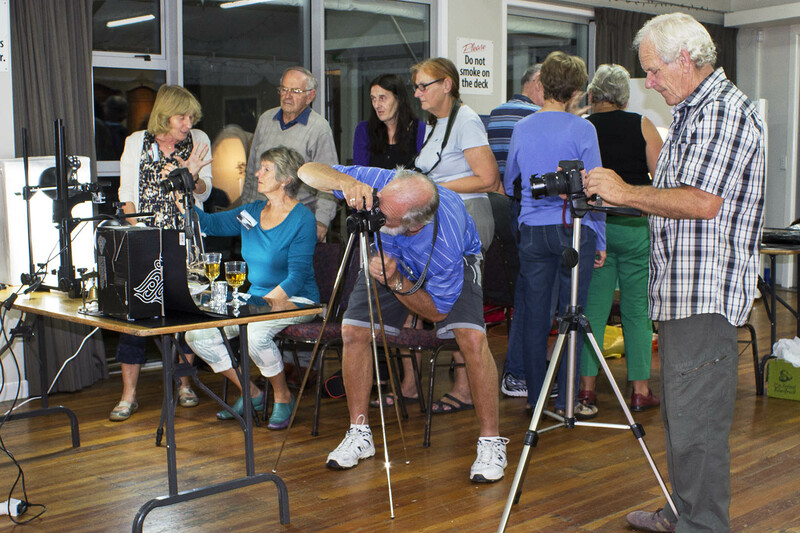 Jo Goudsbloom, Hugh Scott, Gill Mackersy, Gavin Klee and Alison Viskovic set up tables where they demonstrated ways of arranging different backgrounds and subject matter, and using various sorts of lighting. Lighting included hobby lamps used with a light tent, ordinary table lamps, a more professional Bowens light setup, daylight bulbs from a copy stand, and an LED torch. Props included fruit and veg, driftwood, ornaments and glassware, Alison’s illusions materials, and some eggs and plastic netting. People circulated round the tables through the evening, helped each other with ideas and techniques, and there was lots of photographic conversation. 22 people had a very enjoyable evening. Thanks to Alison for the report on the meeting, and to Alison, Jo and Bob for the photos below showing some of the action. 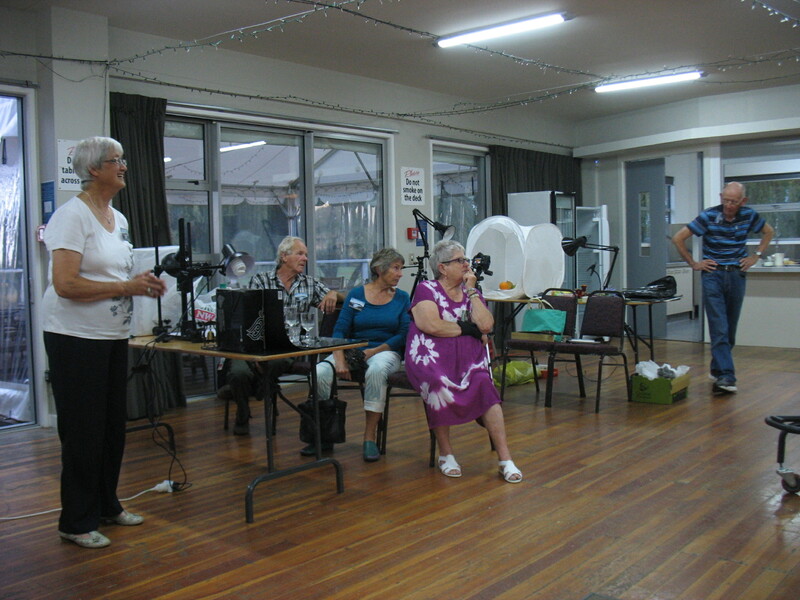 KCPS member Chrissy Garlick featured in an article in this week’s Kapiti News, explaining what she found out about the background to three local Op Shops – Opportunity for Animals, Birthright Kapiti, and the Waikanae Baptist Church. KCPS member Karyn Crocker recently saw this movie at local cinema the Shoreline, about the life and work of photojournalist Sebastião Salgado, and thoroughly recommends it.